Julian Sayarer is a round-the-world cyclist. 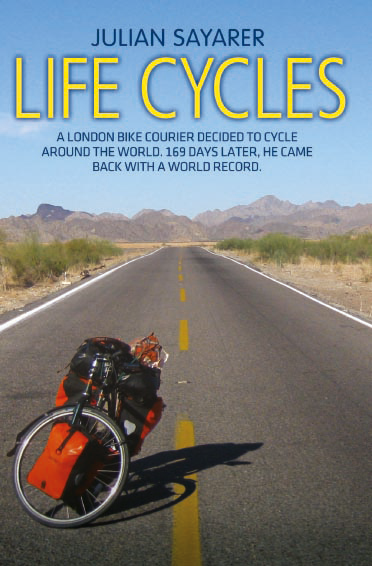 While working as a cycle courier in London, he learns that the world record for a circumnavigation has been broken in conjunction with banks and big business. Seeing the bicycle and open road reduced to only a corporate marketing strategy, he resolves to do things his own way and to take back the record. Come join the Broken Spoke for the evening to hear a story that runs from the streets of London, through insurrections in China to the trailer families of Louisiana. A snapshot of world politics by bicycle, Life Cycles is a 12mph view of the world at the beginning of the twenty-first century. It’s a look at where we are, and sometimes, at how things could be different. Oxford Action Resource Centre (OARC), East Oxford Community Centre, Cowley Rd/Princess St, Oxford, OX4 1DD.